Poor thing never saw them coming. Imagine just standing around, minding your own business and being a dinosaur, when all of a sudden a squad of jerks pop out of the trees and cut off your tail. Such is the life of the digital prey that permeate Monster Hunter: World. To be fair, it's probably good to thin their numbers a little. I imagine having a ton of huge carnivores running around has to be at least a little hard on the ecosystem. The MH:W devs were, naturally, at Gamescom 2017, so it was inevitable that we'd get to see a little more gameplay footage out of it. This time around, a community manager known only as "Socks" leads a few folks through one of the game's many hunts. The video more or less cuts right to the action, so don't click it expecting the preparations and planning that typically come beforehand. Monster Hunter: World is due out in 2018 on Xbox One, PlayStation 4, and PC. 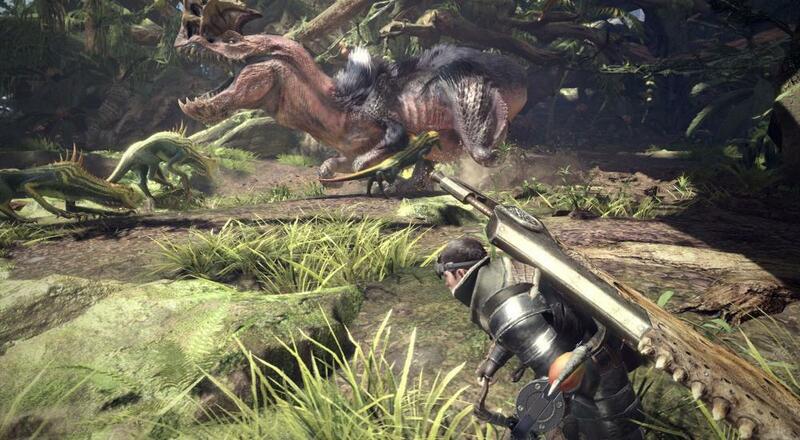 As shown in the video, it'll feature online co-op for up to four players as they track down and subsequently cut the body parts off of lots of different creatures. Word on the street is that it also offers a slightly more streamlined version of the experience, so if you've been hesitant to dip a toe into the franchise, 2018 seems like a great time to try it out. Page created in 0.2593 seconds.